The Mechanic is finally in town! 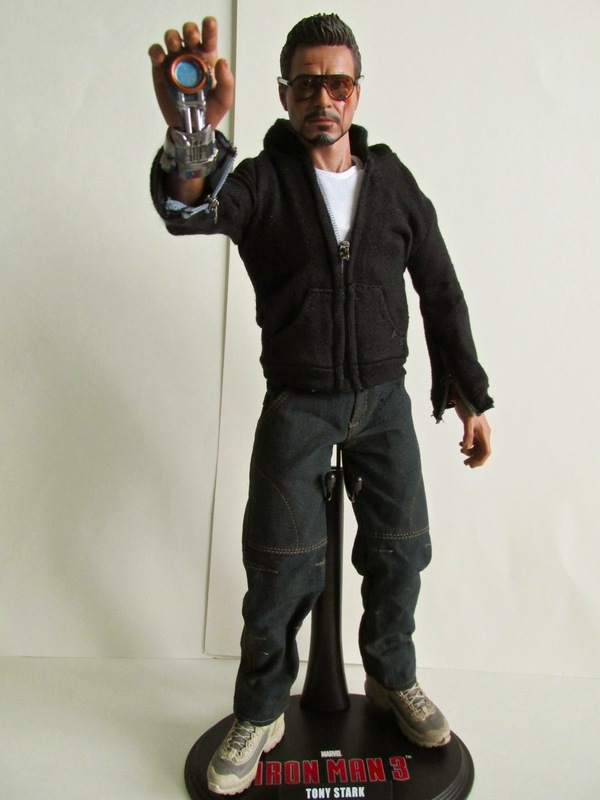 Hot Toys brings another great addition to their Iron Man 3 line of figures. In a surprise move, this figure was actually released like three or four months ahead of its expected release date. Lets hope this trend will continue in the future. 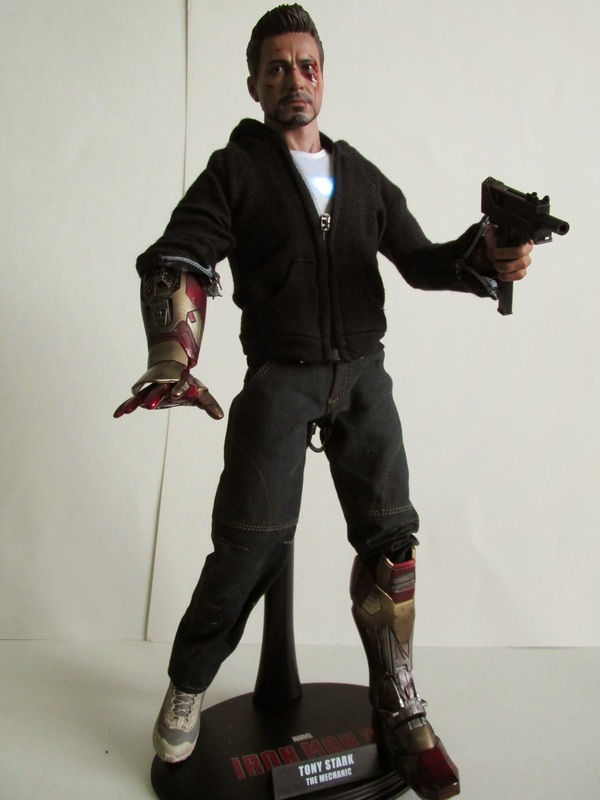 This version of Tony Stark is based on Tony’s appearance in the second half of the film. 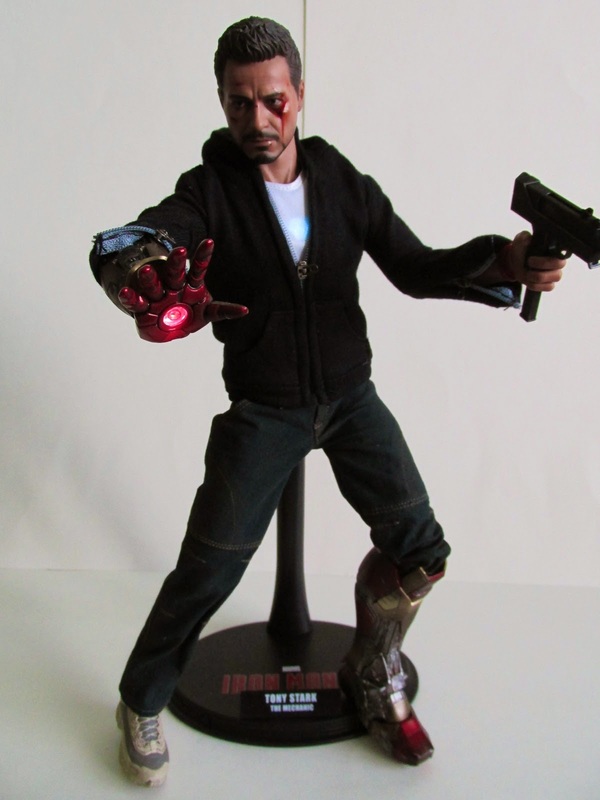 Now bloodied and going through a nervous breakdown, Tony scrambles to build home made weapons and take on the Mandarin in his mansion. 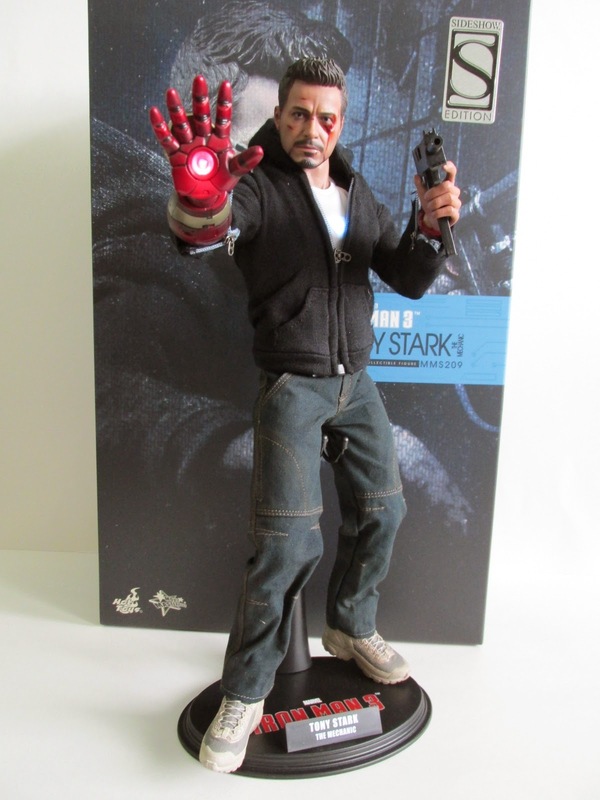 This Tony is essentially the armor testing Tony that was released several months ago only with different clothes and battle damage on his face. 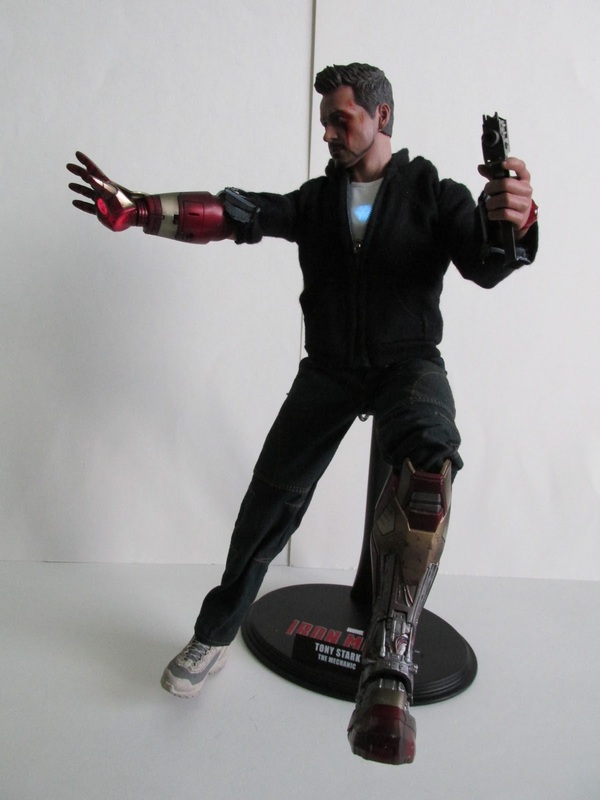 The same body was even used and uses the same switch out system for the limbs that the armor testing Tony used. 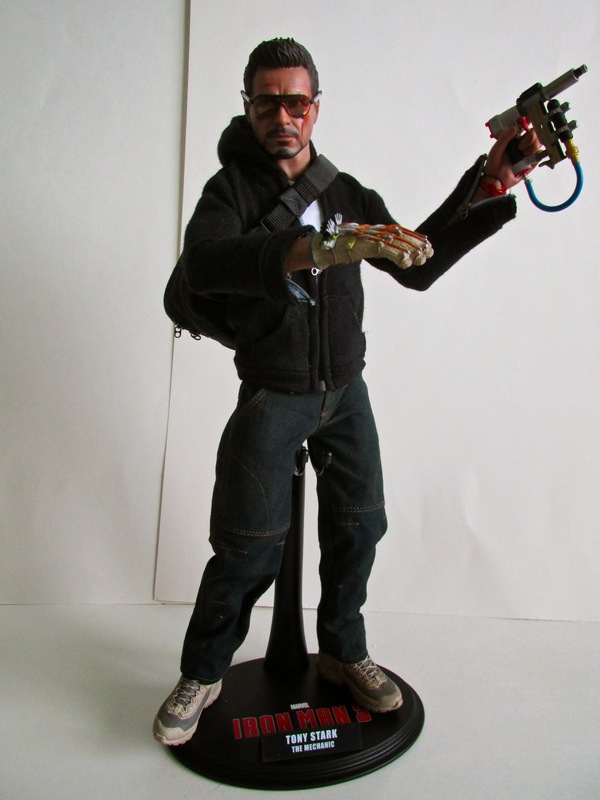 Accessories wise Tony comes with all the homemade weapons he made as well as accessories that can be used to represent Tony in the third act of the film, which comprises of one armored hand, one armored leg, a machine gun, a heads up display with headset and the ex exclusive homemade repulsor. All of the accessories are great as usual with lots of attention to detail. 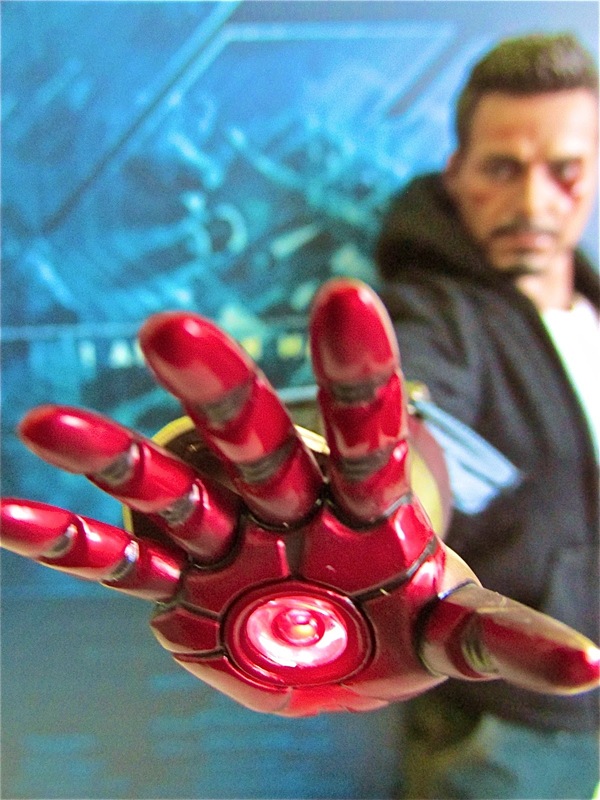 The homemade repulsor is a great touch and a fun prop to have. The armor has great paint apps and is given a great battle damaged look. Another great accessory is his special edition Dora the Explorer watch. It doesn’t come with Dora on it, but it does come with a decal that you can put on the face of the watch that suffices the look of Dora. It also comes with three extra just in case you loose one or it falls off over time. The only problem I had with this figure is the foot armor switch out. I could not put the foot on after I had put on the leg armor. Not being able to put the pants in without scrunching is one thing, but the foot would not go on after putting on the leg armor. The leg armor was actually blocking and stopping the foot from being put on the ball joint. I somehow managed to get a little bit of it on, but I think I broke the knee cap off. 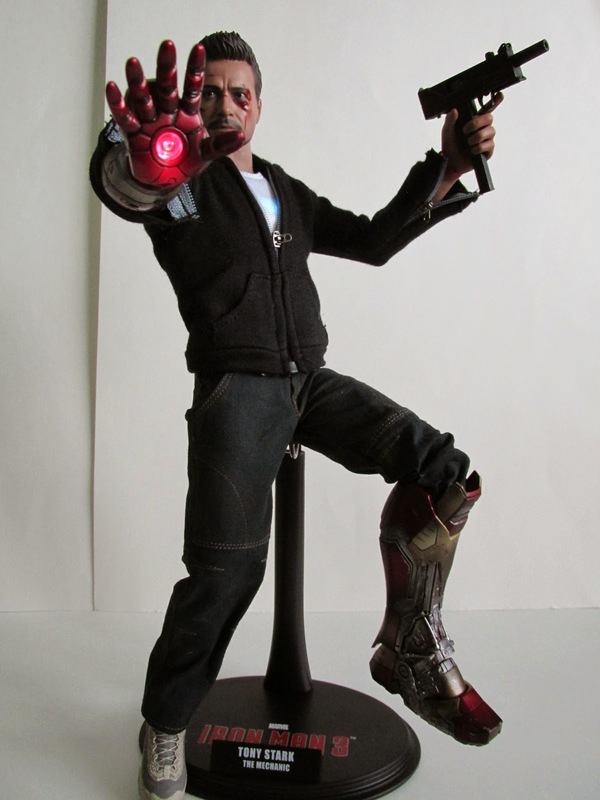 I like this figure, and this will go great with the other Iron Man armors that Hot Toys plans to release. I hope in the future Hot Toys can address this issue of switching out armor pieces on a Tony Stark figure…maybe just include an entire arm or leg that replaces the limb like the Mark VII did with battle damaged arms?